Why Does a Silver Chain Turn Black? Rust is called oxidation, because oxygen in the air starts to chemically react with the iron's outer layers. Silver doesn't oxidize, though; it tarnishes, which is the same as saying that it forms a patina. 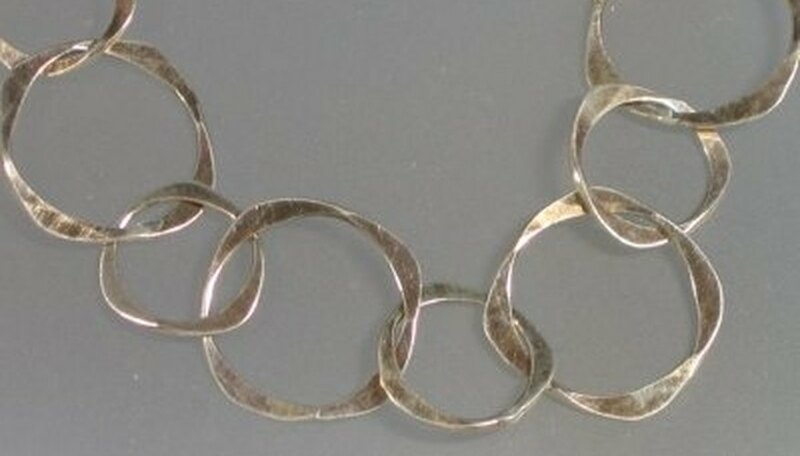 Tarnish is formed when sulfur or sulfur compounds come into contact with silver. Sulfur is present as a free gas in our atmosphere, but it is becoming more prevalent in sulfur dioxide in air pollution from the burning of coal and gasoline. Some soaps contain sulfur compounds, so if you wear your chain while you wash your hands or your dishes, you may speed the tarnishing process. Some groundwater can have considerable concentrations of magnesium sulfate (epsom salt), and in some areas the magnesium sulfate reacts to become hydrogen sulfide, which can rise as a gas through the soil. Many silver polishes contain an abrasive that merely dislodges the tarnish to expose new, untarnished silver underneath. Using these substances will eventually make your silver chain thinner and thinner. In the Resources section, you will find a procedure that allows you to convert the tarnish back into silver by transferring the sulfur to some aluminum foil. Although it is more work, it allows you to keep your chain both shiny and strong for a much longer time. Tarnish will start as a yellowing that gets darker. The longer you leave your chain tarnished, the harder it will be to restore. How Do CFCs Break Down the Ozone Layer? Salzwedel, Mark. "Why Does a Silver Chain Turn Black?" Sciencing, https://sciencing.com/silver-chain-turn-black-5192018.html. 24 April 2017.